Strangely Common Anime Blog: Why didn't anyone tell me that these kind of things exist? I didn't know anyone sells anime merchandises here in cold and dark north, but apparently I was wrong. I found store called Blippo by accident, small niche sellers are always hard to find. 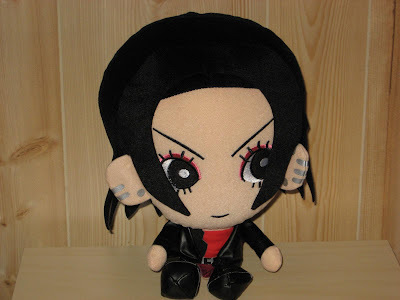 But anyway, there was this lovely Nana plushie I had to buy. It was little expensive, but when it comes to Nana related merchandises price is irrelevant. Also, Nana alarm clock. Yeah, I will buy almost anything if they dare to print that four letter sign of awesomeness to it. Though the clock doesn't work, but that's not important. And btw, it's shame I'm not a girl... I mean, there is lot of girly stuff like scarfs and handbags leaving only limited choices for me. I would give my soul to get Reira wallscroll, but chances right now look rather poor. All in all, I'm going to change the way I use money. 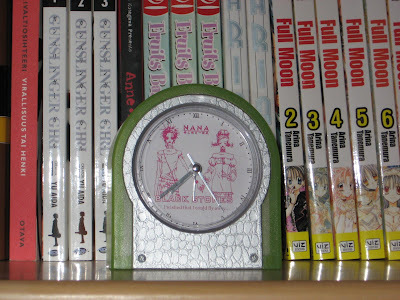 No dvds unless it's really short and good, far less manga volumes than before and more euros to these. Otherwise my spending increase too much and results aren't too pretty. Hmmm. I was nodding as I was reading that second paragraph. Hey you guys! I'll be starting to sell all sorts of anime merchandise from my site. So do look out! And its' not just figures but the little ones as well.